“THE TALK OF THE CITY. (New York, NY – December 17, 2013) Producers Howard and Janet Kagan are proud to announce a two-week extension to the limited engagement of NATASHA, PIERRE & THE GREAT COMET OF 1812, currently playing at Kazino (45th Street between Times Square and 8thAvenue). Recently named one of the Best Musicals of 2013 by The New York Times and one of Time Magazine’s Top 10 Musicals of 2013, THE GREAT COMET will now play its final performance on Sunday, January 19, 2014. Tickets are on sale now at Telecharge.com. 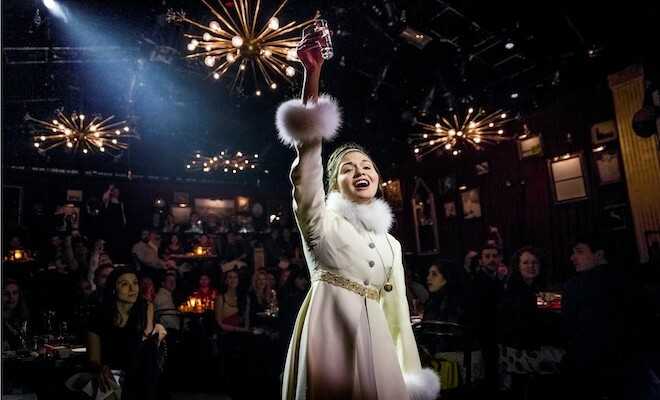 Since its first production at Ars Nova in the fall of 2012, THE GREAT COMET has become a sensation, meriting expansion this summer to a 199 seat pop-up supper club built specifically for the production in the Meatpacking District. After playing to packed houses since May, producers Howard & Janet Kagan brought Dave Malloy’s acclaimed electropop opera and its opulent custom venue – Kazino – to the heart of the theater district in September of 2013. Tickets for performances through January 19, 2014 are now on sale through Telecharge.com. Ticket prices begin at $75, with prime and premium seating available for $175 and $237.50, respectively. The playing schedule is as follows: Tuesdays at 8, Wednesdays at 2:30 and 8, Thursdays at 8, Fridays at 8, Saturdays at 2:30 and 8, and Sundays at 3. At evening performances, audiences receive an assortment of Russian snacks at their tables, including the show’s signature pierogies. At matinee performances, audiences are treated to a Russian High Tea, complete with tea service and pastries. Tickets are also available for a special New Year’s Eve performance and party. Celebrate the New Year in luxury at New York City’s opulent Russian supper club, Kazino, with food, drink, music, dancing and Tolstoy’s hottest young lovers.With the Full Experience package, the celebration begins at 6:30pm with a 4-course Russian feast followed by a performance of THE GREAT COMET at 8pm. Immediately following the performance, you can keep your table and waiter service during the New Year’s Eve Party, which begins at 11pm and doesn’t end until 2014. From 11pm to 2am, enjoy a DJ, dancing and open bar. The Full Experience package costs $695 and is available at Telecharge.com. The cast of NATASHA, PIERRE & THE GREAT COMET OF 1812 includes: David Abeles as ‘Pierre,’ Brittain Ashford as ‘Sonya,’ Blake DeLong as ‘Bolkonsky/Andrey,’ Amber Gray as ‘Hélène,’ Nick Choksi as ‘Dolokhov’, Grace McLean as ‘Marya D.,’ Ashkon Davaran as ‘Balaga,’ Phillipa Soo as ‘Natasha,’ Lucas Steele as ‘Anatole.’ and Shaina Taub as ‘Princess Mary.’ The cast also features Catherine Brookman, Josh Canfield, Ken Clark, Lulu Fall, Luke Holloway, Azudi Onyejekwe, Mariand Torres and Lauren Zakrin. Directed by Rachel Chavkin, NATASHA, PIERRE & THE GREAT COMET OF 1812 has been showered with rave reviews and a host of accolades, including the 2013 Richard Rodgers Award for Musical Theater, a Special Citation from the OBIE Awards, five Drama Desk Award Nominations (Outstanding New Musical, Outstanding Music, Outstanding Lyrics, Outstanding Direction of a Musical, Outstanding Costume Design), two Drama League Award nominations (Distinguished Production of a Musical, Distinguished Performance – Phillipa Soo), a Henry Hewes Design Award (for scenic design by Mimi Lien), and the Off-Broadway Alliance Award for Outstanding New Musical. The original cast recording of NATASHA, PIERRE & THE GREAT COMET OF 1812 was released digitally by Ghostlight Records on Tuesday, October 29 and the deluxe two-CD set is now available in stores. A highlights version, featuring special selections from the acclaimed work, is also now available in digital format. The two-disc album was recorded Monday, August 26th at MSR Studios in New York City. The album was produced by Dean Sharenow, with Kurt Deutsch and Howard & Janet Kagan serving as Executive Producers. NATASHA, PIERRE & THE GREAT COMET OF 1812 features choreography by Sam Pinkleton, scenic design by Mimi Lien, costume design by Tony® Award winner Paloma Young, lighting design by Bradley King, music direction by Or Matias, sound design by Matt Hubbs, music supervision by Sonny Paladino and casting by Duncan Stewart and Company. NATASHA, PIERRE & THE GREAT COMET OF 1812 is produced by Howard and Janet Kagan and co-produced by Paula Marie Black, John Logan, Lisa Matlin, Daveed Frazier, Tom Smedes, and Vertical Entertainment/Roman Gambourg/Lev Gelfer.